At the invitation of Mr Ram Nath Kovind, President of the Republic of India, H.S.H. 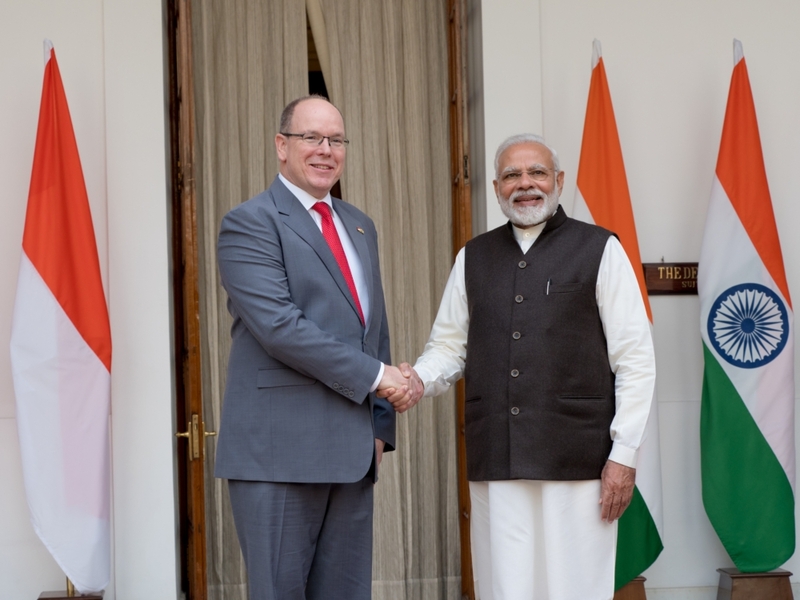 Prince Albert II travelled to New Delhi on 4 and 5 February 2019 to conduct an official visit combining economic, environmental and diplomatic engagements as well as meetings with the highest authorities of the State. Early in the afternoon of Monday 4 February, the Sovereign Prince hosted the Indian Federation of Chambers of Commerce and Industry (FICCI) and the Monaco Economic Board (MEB) which brought together business leaders of the two countries (about thirty Monegasque entrepreneurs) in the presence of Mr Suresh Prabhu, Indian Minister of Commerce and Industry and Civil Aviation and Mr Gilles Tonelli, Government Advisor - Minister of External Relations and Cooperation of the Principality. A Memorandum of Understanding (M.O.U.) was signed between FICCI and MEB on increased cooperation and exchanges between the two entities. In the late afternoon, H.S.H. the Prince and the leaders of His Foundation (FPA2) participated in a conference on the theme "Energy and Climate" organised by The Energy and Resources Institutes of New Delhi (TERI). A M.O.U. was also signed at the end of this meeting. In the evening, a private dinner in honour of His Serene Highness was offered by Mr Raja Randhir Singh, Honorary Member of the International Olympic Committee. On the morning of Tuesday 5 February, H.S.H. Prince Albert II visited Raj Ghat, a memorial dedicated to Mahatma Gandhi, the Father of the Indian nation. The Prince, accompanied by his delegation, spent some time there and then laid a wreath in tribute. The Sovereign Prince then met with the highest authorities of the country. He was first received in audience by Mrs Sushma Swaraj, Minister of Foreign Affairs, and Mr Narendra Modi, Prime Minister. Then, the Sovereign went to Rashtrapati Bhavan, the Presidential Palace and residence of Mr Ram Nath Kovind, President of the Republic of India since 2017. After an audience with the Indian President, the Prince planted a "Princess Grace" rose in the residence’s beautiful garden. After this a lunch was offered by President Kovind to the delegations of the two countries who were able to take the opportunity to talk together. 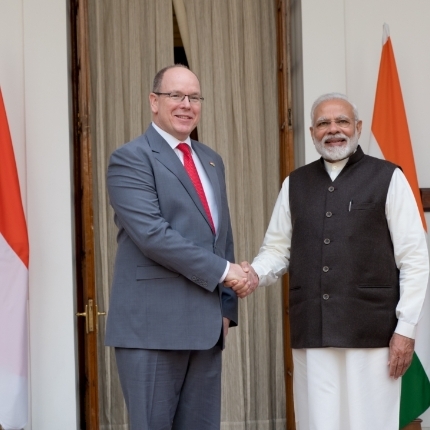 In the afternoon, the Prince went to the National Gandhi Museum and then presided over a reception organised by the Monaco Embassy in India where a hundred Indian and Monegasque dignitaries were invited.